McIntyre has won a combined total of four Hugo and Nebula awards and has been nominated for nine more! Rather impressive. She has written in the Star Trek and Star Wars universes as well as her own original creations. An outstanding writer, who is certainly worth reading. Only a little of her fiction (all flash) is free online. Her homepage is here. "A Modest Proposal" Science Fiction. "LADeDeDa" with Ursula K. Le Guin. Science Fiction. 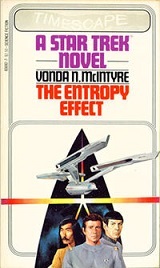 • At StarShipSofa: "A Modest Proposal" by Vonda N McIntyre. Flash Audio. 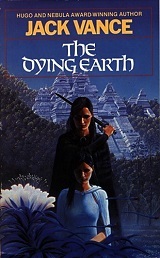 Vance was a successful Fantasy and Science Fiction (as well as mystery) writer whose fiction won two Hugo awards, a Nebula Award, a World Fantasy Award, and an Edgar (a mystery writing award). Among his great works, The Dying Earth stories are probably the works for which he is best known. His home page is here. "Through the dim forest came Liane the Wayfarer, passing along the shadowed glades with a prancing light-footed gait. He whistled, he caroled, he was plainly in high spirits. Around his finger he twirled a bit of wrought bronze—a circlet graved with angular crabbed characters, now stained black." • At Infinity Plus: "Green Magic"
"The existence of disciplines concentric to the elementary magics must now be admitted without further controversy," wrote McIntyre. "Guided by a set of analogies from the white and black magics (to be detailed in due course), I have delineated the basic extension of purple magic, as well as its corollary, Dynamic Nomism." • At Project Gutenberg: "Sjambak" 1953. "Wilbur Murphy sought romance, excitement, and an impossible Horseman of Space. With polite smiles, the planet frustrated him at every turn—until he found them all the hard way!" At LibriVox: "Sjambak" in Short Science Fiction Collection 27. At StarShipSofa: "The Moon Moth" Part 1 and Part 2. • At Internet Archive: "The Potters of Firsk" (direct MP3 download) - Dimension X. "A liaison officer from Earth is caught between a steely planetary administrator and a fanatical alien cult who kidnap and murder people to use as raw materials for their sacred pottery. "- OTR Plot Spot. Le Fanu was a leading nineteenth century writer of Gothic Horror and ghost stories. He wrote many stories, but is best known for his novella "Carmilla" which was a popular vampire story 25 years before Dracula was written. Certainly worth a read for Vampire fans, as well as fans of Gothics and other nineteenth century stories. "In Styria, we, though by no means magnificent people, inhabit a castle, or schloss. A small income, in that part of the world, goes a great way. Eight or nine hundred a year does wonders. Scantily enough ours would have answered among wealthy people at home. My father is English, and I bear an English name, although I never saw England. But here, in this lonely and primitive place, where everything is so marvelously cheap, I really don't see how ever so much more money would at all materially add to our comforts, or even luxuries." • Other works by Le Fanu. At LibrVox: Other works by Le Fanu.